On 15.06.2017, Stadler presented the first bimodal FLIRT at Bussnang (CH). The train is destined for the Valle d’Aosta region. Stadler presented the very first FLIRT with bimodal drive system to an audience of customers and Italian guests – railway operators, regional representatives from Valle d’Aosta, Piedmont, Molise and Calabria, and media representatives. The environmentally friendly vehicle is equipped for 3 kV DC electrified lines, and has a diesel-electric drive for non-electrified lines. Its low axle load, at a maximum of 18 tonnes, is particularly impressive. 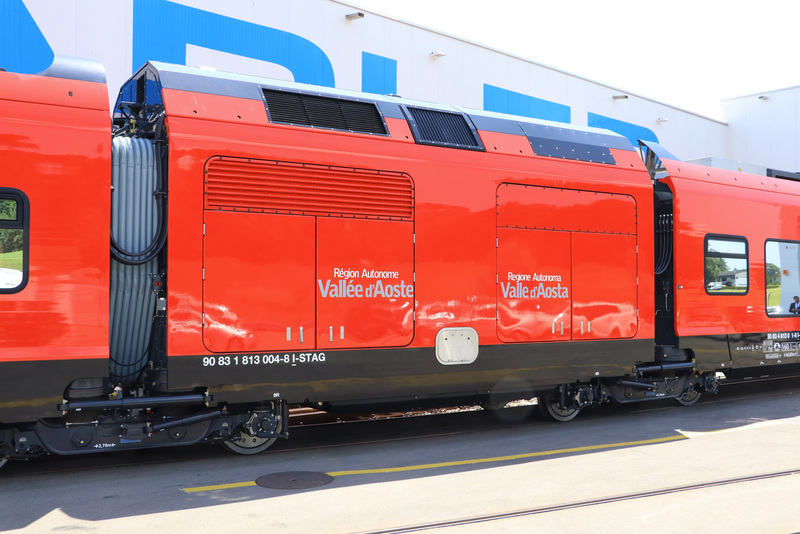 The Valle d’Aosta region ordered five of these bimodal FLIRT vehicles (BMU) in May 2015. This vehicle was presented in Bussnang and at the nearby commissioning centre in Erlen after a development and construction period of just over two years. Dr Pierluigi Marquis, President of the Valle d’Aosta regional council, and Peter Jenelten, Executive Vice President of Marketing and Sales at Stadler, cut the ribbon in a festive ceremony marking the vehicle’s debut on the rails. Like all FLIRT vehicles, the first bimodal FLIRT is constructed using an extruded aluminium profile, making it light and energy-efficient. 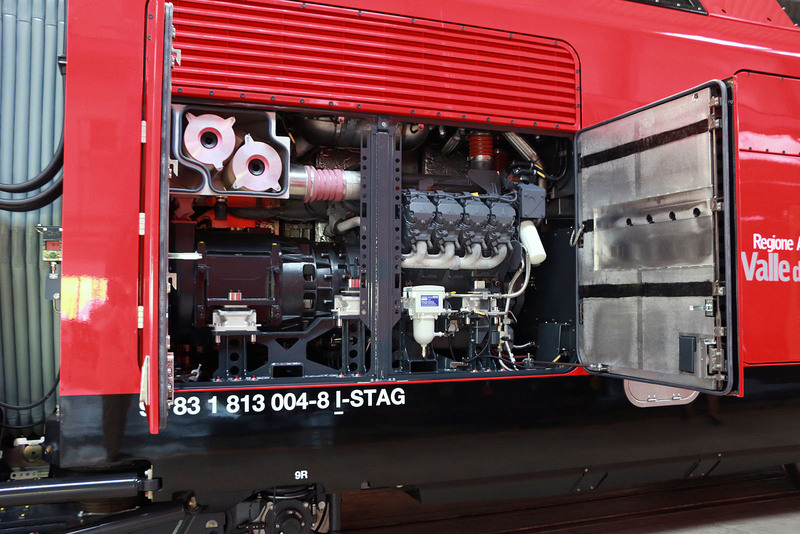 The 3-car vehicle features an additional, accessible power module housing the two Deutz V8 diesel engines (Euro IIIB), the fuel tank and additional drive equipment. The vehicle is 66,8 m long, 2,82 m wide and 4,12 m tall. Its maximum speed is 160 km/h in E-mode, 140 km/h in D-mode. This FLIRT vehicle for the Valle d’Aosta region is a milestone for Stadler: it is the first FLIRT to feature a bimodal drive system. Its low axle load of a maximum of 18 tonnes is unique among bimodal regional trains. This means that the vehicle is also suitable for secondary lines. 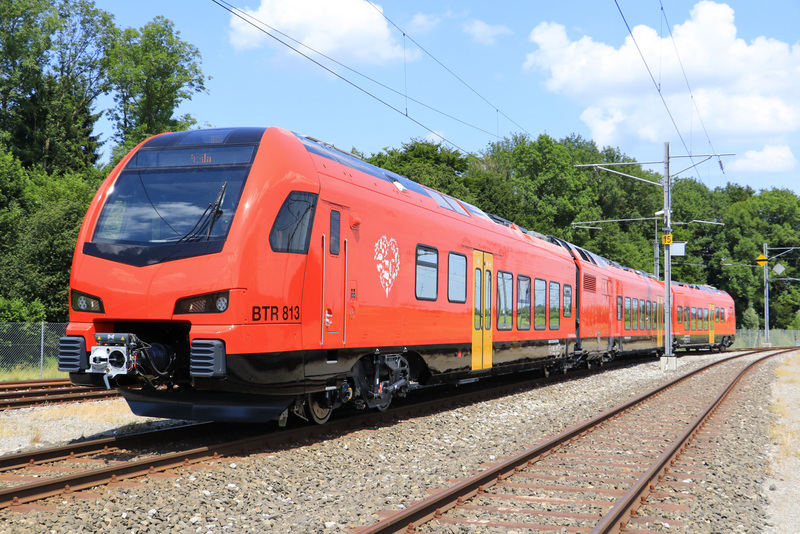 The FLIRT for the Valle d’Aosta region is now undergoing the required approval tests. The first vehicle will be put into commercial operation on the Aosta–Turin line in May 2018. 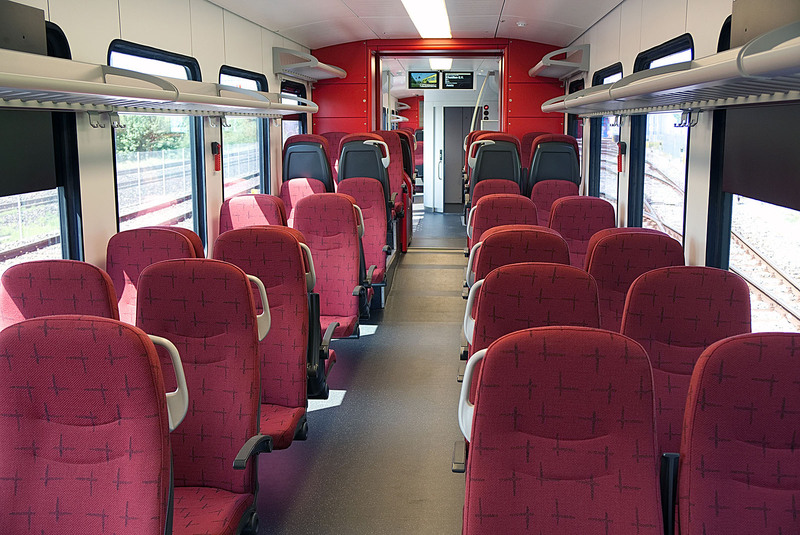 Railcolor: Over the past two years, the design of the trains changed. Originally the hybrid would be painted in blue with white skirts. This was changed into red later on. Was is remarkable now, is that the first presented vehicle has no the golden/yellow line on frame height.